Ready to power your organization? 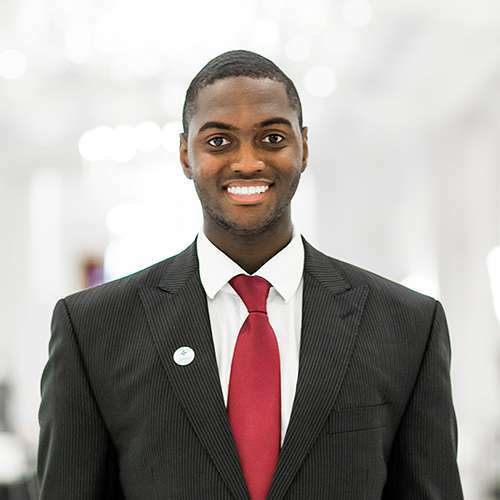 Thousands of young Americans are eager to make a difference in communities like yours! By hosting a service year, your organization will have the opportunity to engage these individuals to increase your impact together over the course of a year. They learn new skills and gain experience – and your organization gets committed, full-time corps members whose service will support your mission. Through this partnership, you can serve more clients, extend your reach into the community, or build your organization’s capacity to achieve its goals. Not only that – service years are a great way to attract new talent to your organization. While you’re under no obligation to hire the corps member at the end of the year, many organizations are so satisfied that they find a place for their corps members on their staff. Sound good? All that stands between you and a team of corps members is a Service Year account! Watch this short video to understand the ins and outs of the site! Service Year makes hosting a team of corps members accessible to nonprofits of all sizes. As long as your organization is a nonprofit, government agency, religious congregation, or higher education institution with at least one paid full-time employee, Service Year could be just what you need to power your work. Showcase opportunities and information about your organization on your custom profile. Create, manage, and promote your positions and recruitment postings in one central location. Gain access to a nationwide pool of potential corps members. Collaborate with your colleagues by adding them to your Service Year organization. Need funds to support your opportunities? In a few simple steps, you can create a crowdfunding page of your own, where stakeholders and supporters can make donations to help raise money for your service positions. Service Year gets your campaign in front of the eyes of like-minded people and organizations—giving you the visibility you need to meet and exceed your fundraising goals. Once you’re up and running, you can advertise your unique opportunities on the exchange, and start recruiting corps members right away. The Discover Page brings ideal candidates to the forefront of your search, by allowing you to filter potential members by their interests, skills, and availability. At the same time, the platform will notify you as soon as a corps member expresses interest in your position, and provide you with a running list of interested candidates—making it easy to manage your recruitment pool. 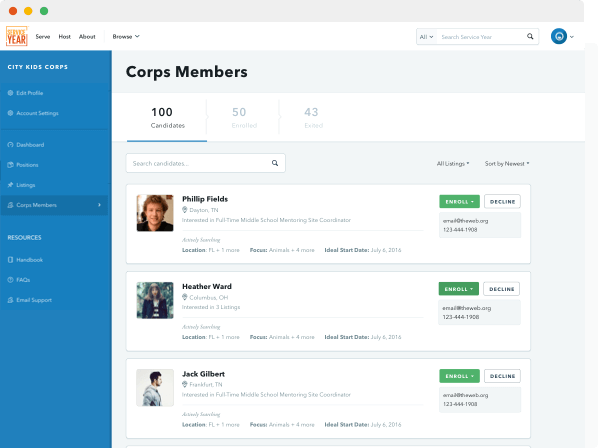 Once you’ve locked down your team, you can manage everyone from prospective corps members to alums right on your dashboard. Track corps members’ progress with performance notes throughout their service, and award them with customizable certificates when they complete their Service Year. You’ll even be able to follow along as corps members post about their service experience, and collect genuine testimonials that can be used to promote your program. Service empowered me to realize that I—we—can make a real, large, and tangible difference. We have the ability to be change agents in the world. Ready to host a Service Year?